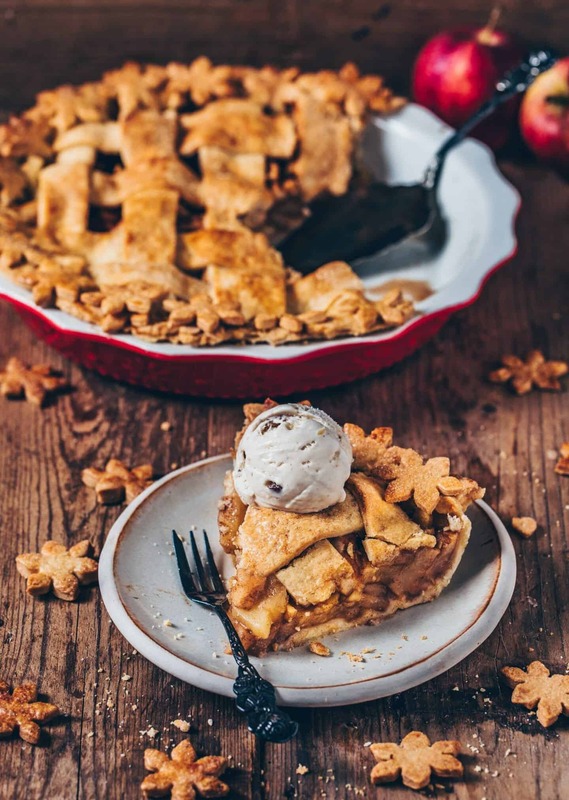 After posting so many delicious Apple Pie desserts on Instagram, it’s definitely time to share my favorite recipe for a classic American Apple Pie on my blog. 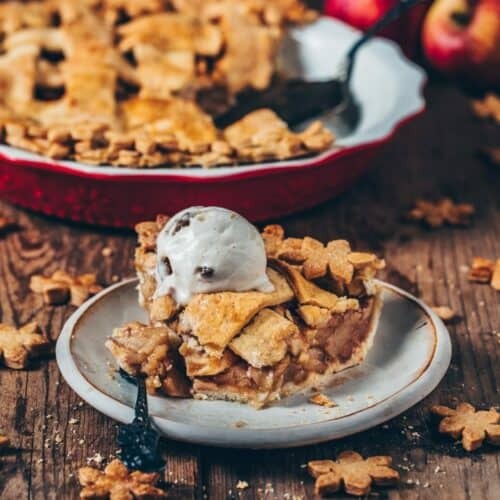 This recipe is actually the basic recipe that I have also used for all other treats, such as mini apple pie muffins, apple pie hand pies, and hot apple pie pockets. If I had to decide which cake I like best, it would be most likely an apple cake or apple pie. Not only because this simple pie is so easy to make, but also because it’s so incredibly delicious. 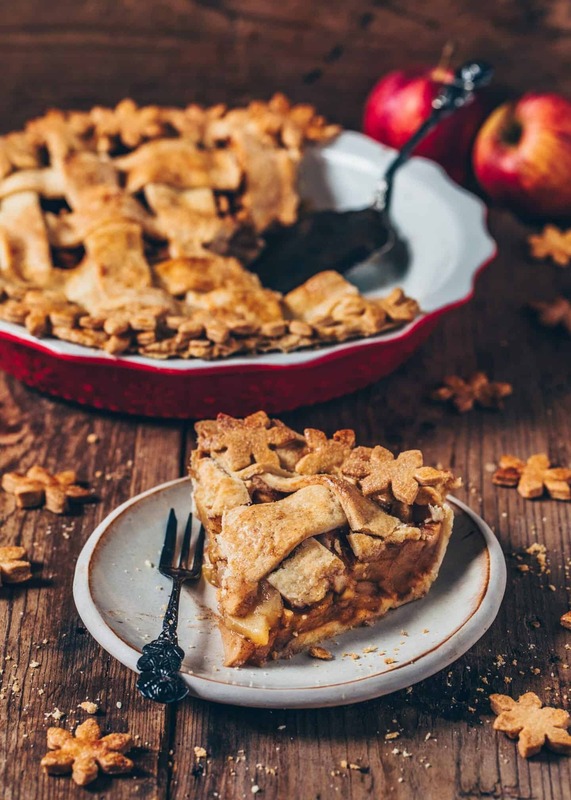 The cinnamon apple filling makes it perfect for fall, but also reminds of Christmas and Thanksgiving. 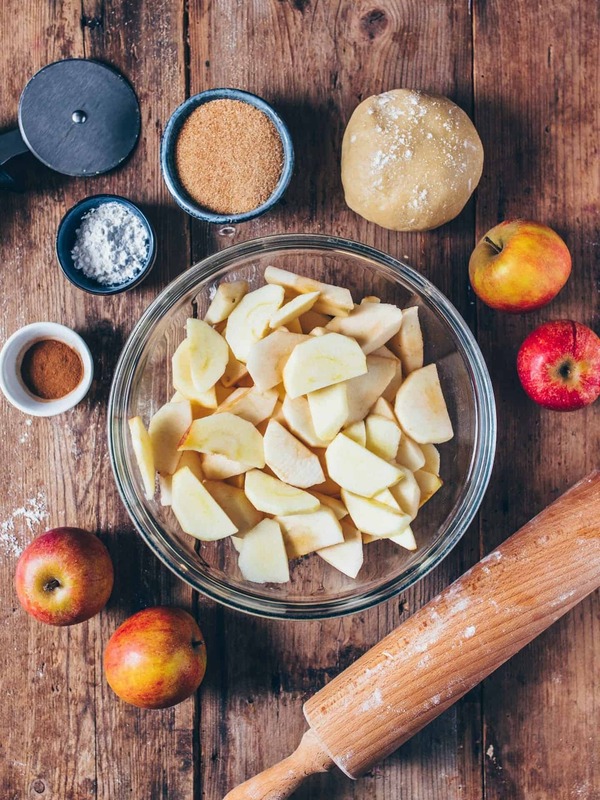 Once your house starts smelling so heavenly, thanks to the baked cinnamon apples, you‘ll notice what I mean and get into a cozy and relaxed Christmas mood. 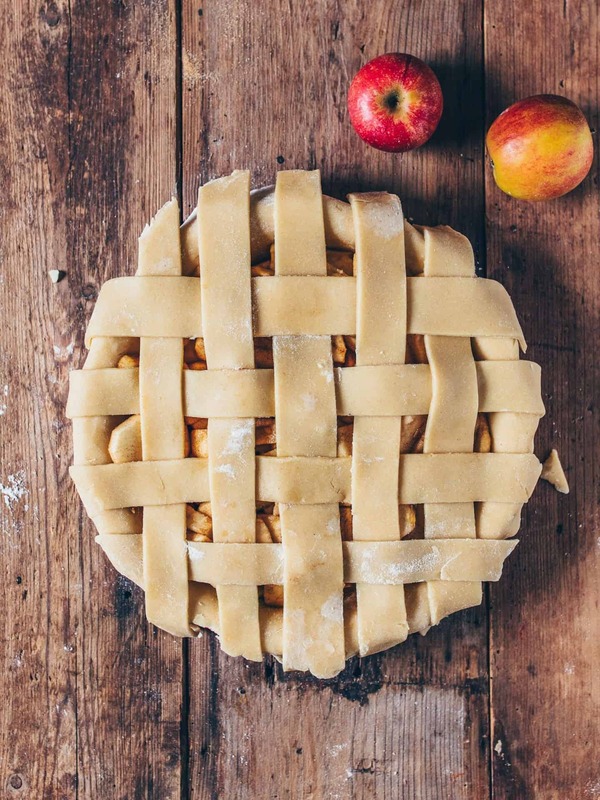 Traditional Pie crust is usually made of flour, butter, a bit of sugar, water and a pinch of salt. 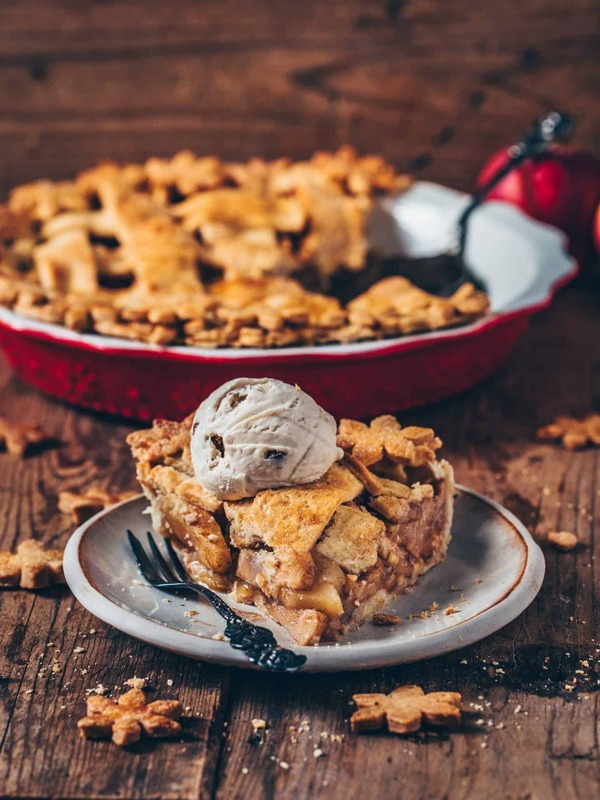 To make this Pie crust dairy-free, I use vegan butter. I assure you, the result will be the same and as delicious as using regular butter. You will not notice the difference. I prefer making the pastry myself, but you can also use store-bought pastry dough to make this recipe. 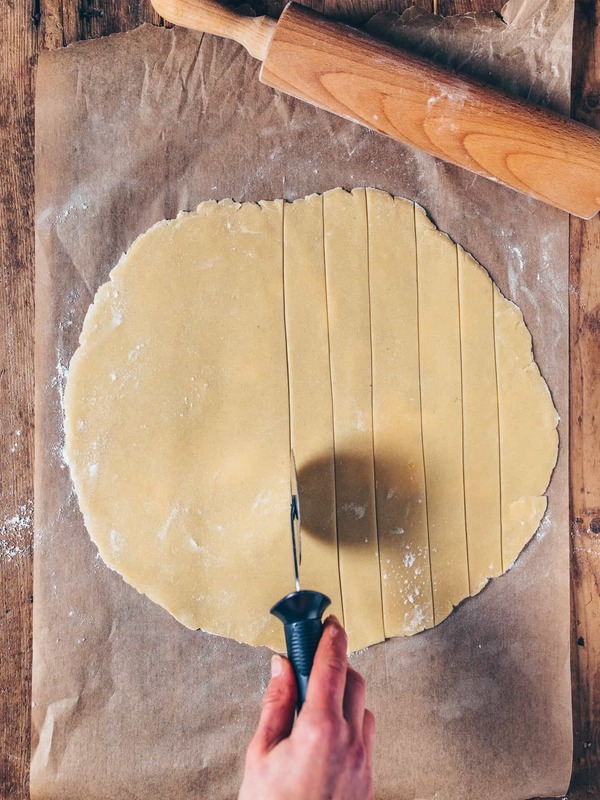 First, cut the prepared pastry dough in half and roll out both halves. 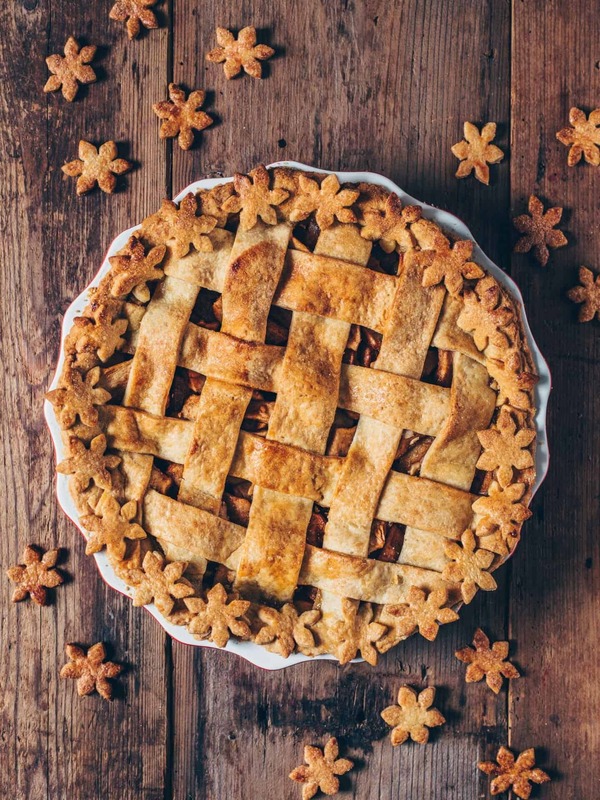 One half is for the bottom, and the other half is to cover the Pie. You can either put the second rolled out dough as a whole on top, or cut into strips using a pizza cutter or knife to make a lattice design, as I did. To make the filling, peel and core the apples, then slice thinly. 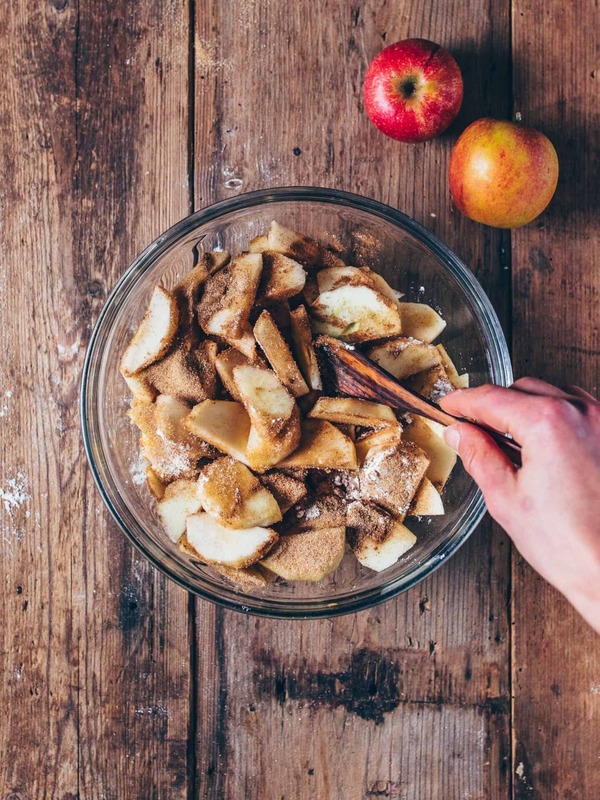 Combine sliced apples with sugar, cornstarch, cinnamon and lemon juice in a large bowl. Toss until the apples are well-coated and set aside. 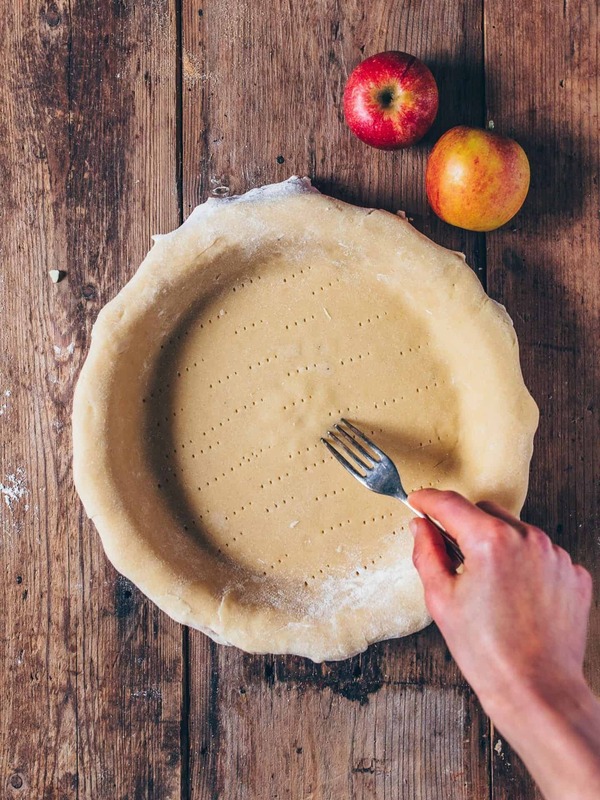 Transfer the rolled out pastry dough for the bottom to a greased 10,5-inch (27-cm) pie dish or springform tin and gently press against the bottom and sides. 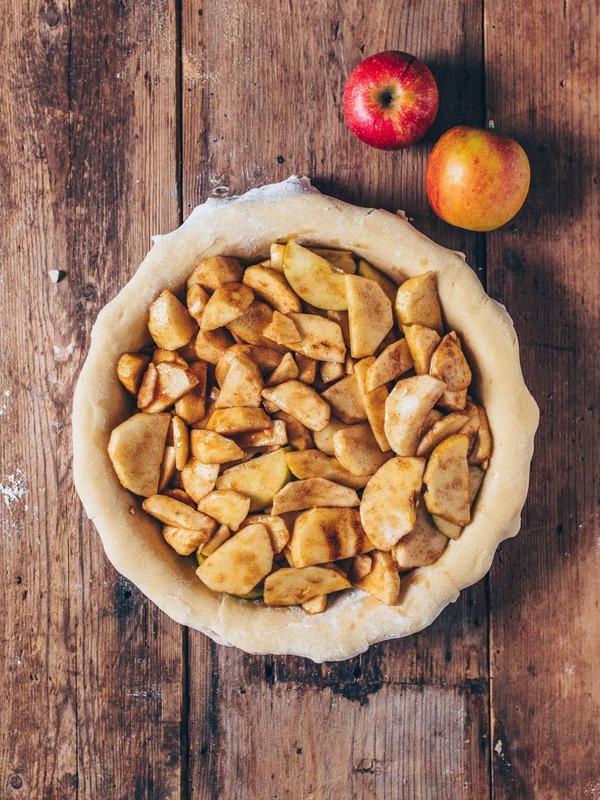 Prick the bottom of the pie crust all over with a fork and then fill with the apples. 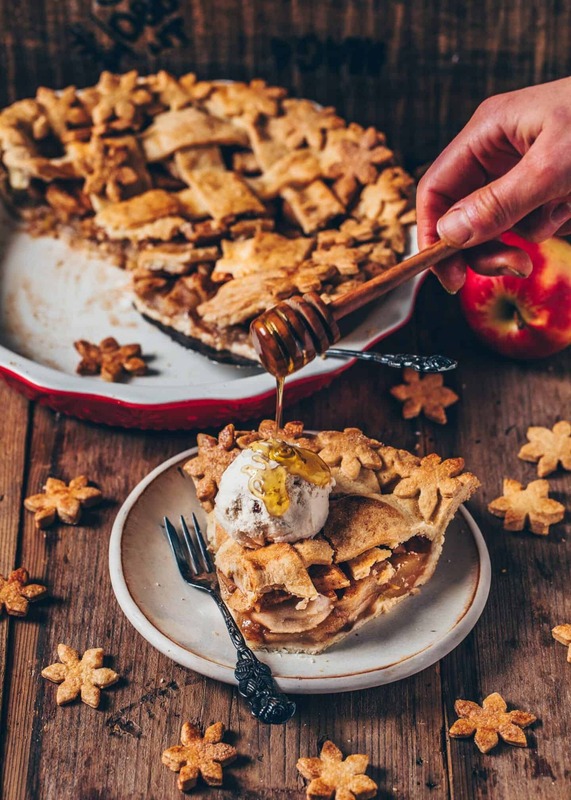 The perfect dessert for fall, winter and any occasion! 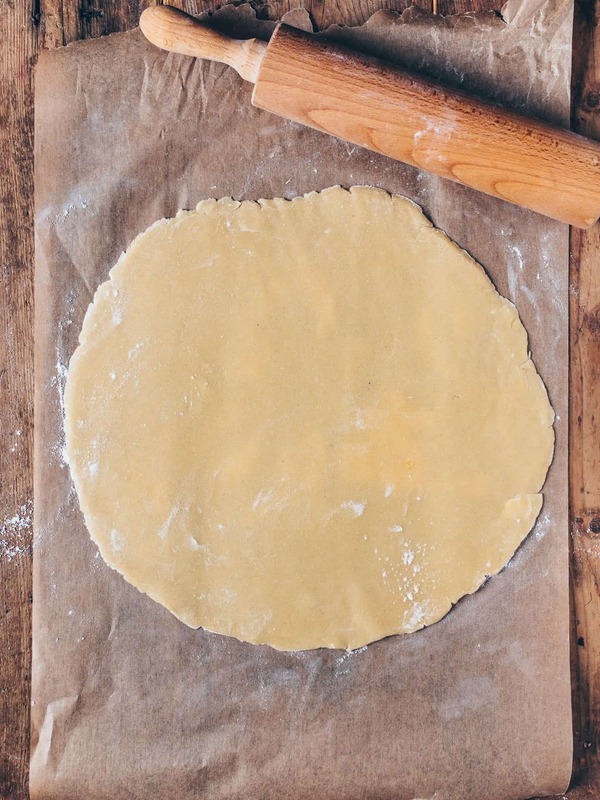 Divide the dough in half and shape into a ball or disc. Wrap in cling film and refrigerate for at least 1/2 hour. Peel and core the apples, then thinly slice. Transfer to a large bowl and add sugar, cornstarch, cinnamon, and lemon juice. Toss until the apples are well-coated. Set aside. On a lightly floured surface, roll out one half of the dough. Transfer to a greased pie dish* and gently press against the bottom and sides. 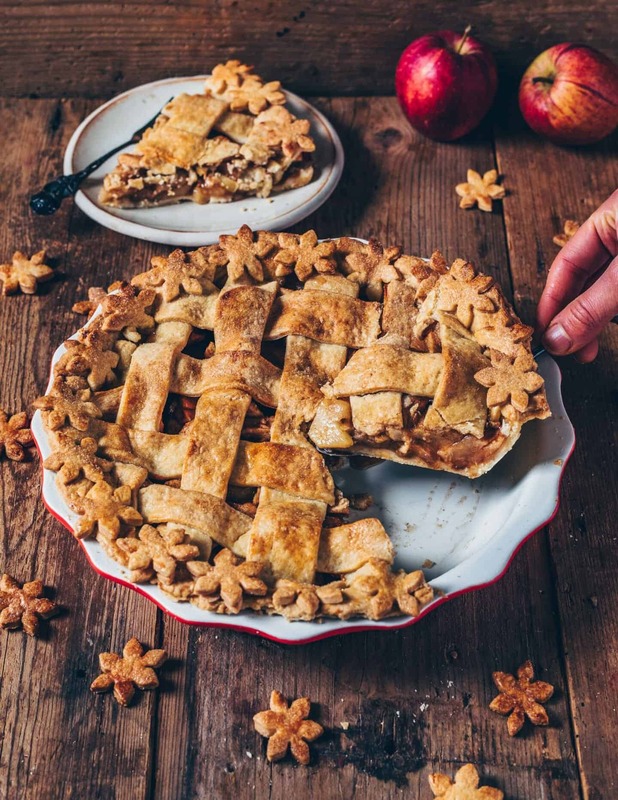 Prick the bottom of the pie crust all over with a fork and then fill with the apples. Now roll out the other half of the dough and cut into strips. 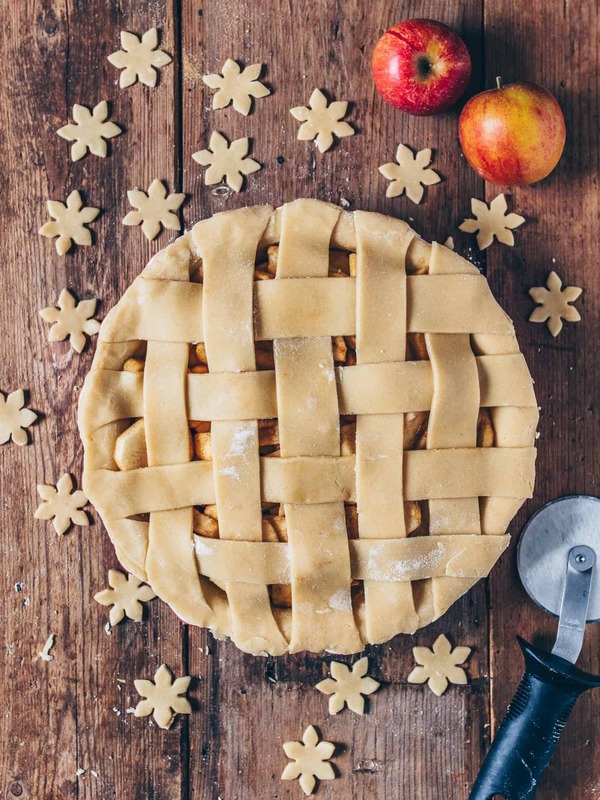 Lay them on top of the pie to make a lattice design (or cover with the whole rolled out dough*). Trim the overhanging dough and crimp around the edges. 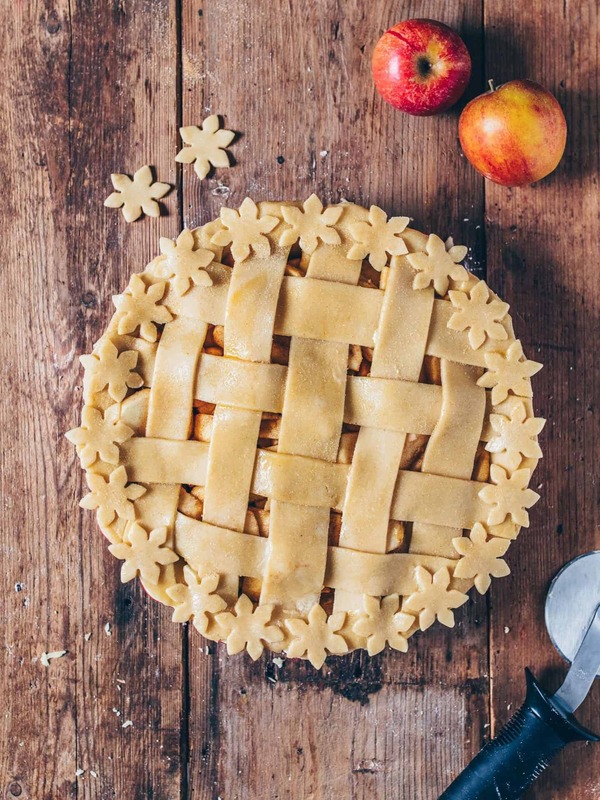 Optionally, use any leftover pastry to make decorations for the pie. Shape the remaining dough into a ball, roll out again and cut out designs of choice using a cookie cutter. Place them on top of the pie crust. 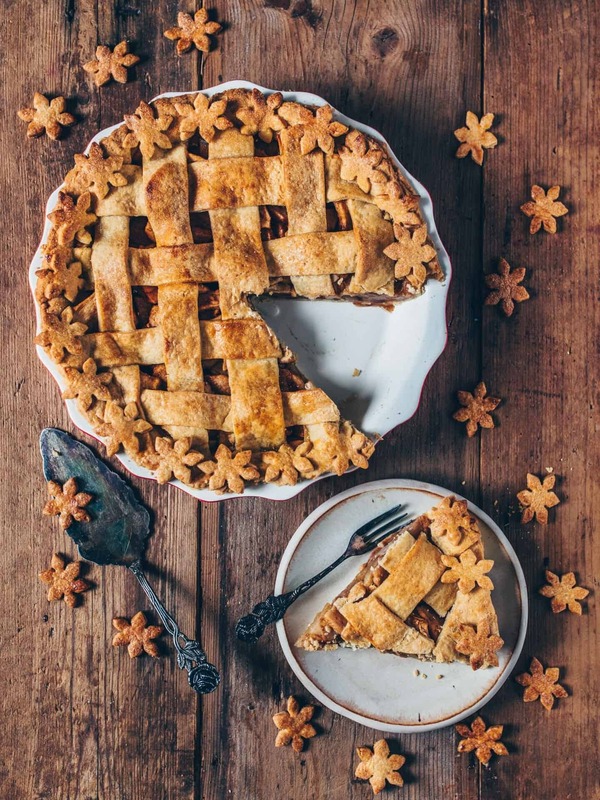 Brush the top of the pie with a little plant-based milk/ cream or melted coconut oil and sprinkle with a bit of brown sugar. Bake the pie for about 50-60 minutes until golden brown. Cover the sides or top with tin foil if it gets too dark during baking. 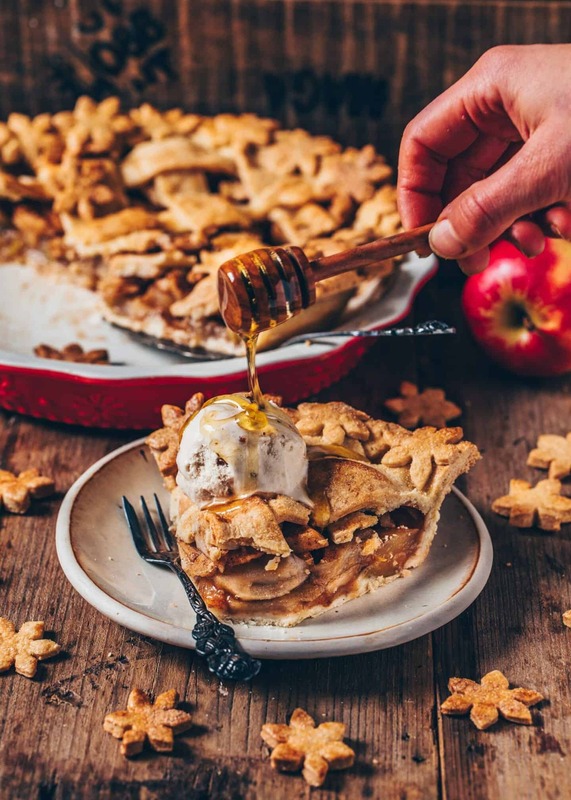 Let your Apple Pie cool before serving. Serve with a dollop of vegan ice cream and extra syrup, if you like! I used a 10,5-inch (27-cm) pie dish but you could also use a tartform or springform pan. A smaller size should work too. To make this cake gluten-free, you can use a gluten-free flour blend 1:1. 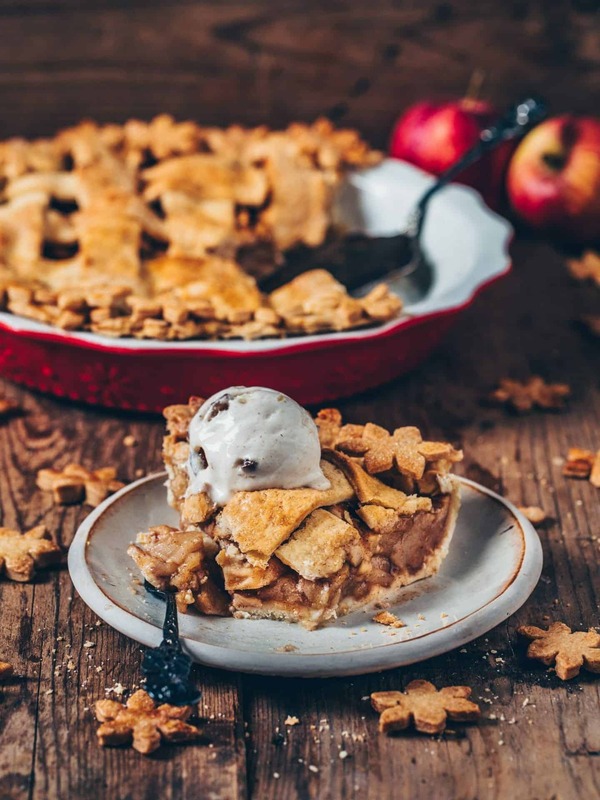 To make this Apple Pie sugar-free, you can use Erythritol. You could also use coconut sugar, or regular white sugar, if you like. 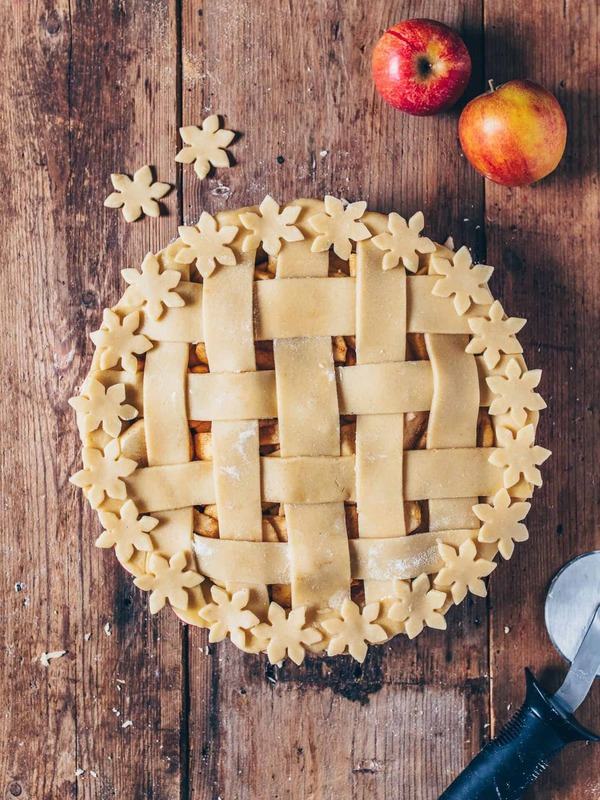 If you prefer to cover the pie with the whole rolled out crust (without cutting into strips to create a lattice design), then make sure to cut a hole in the center of the top crust (or prick a few times with a fork) to allow steam out. 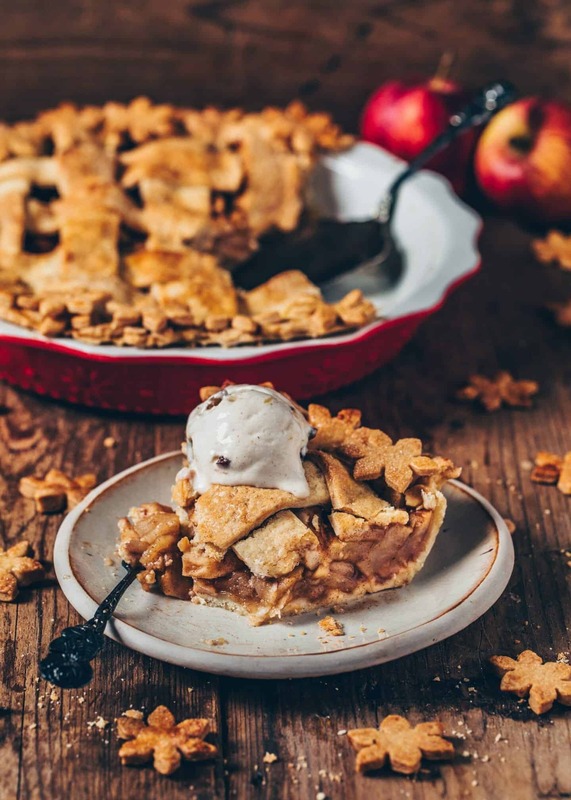 I can’t wait to make this apple pie! 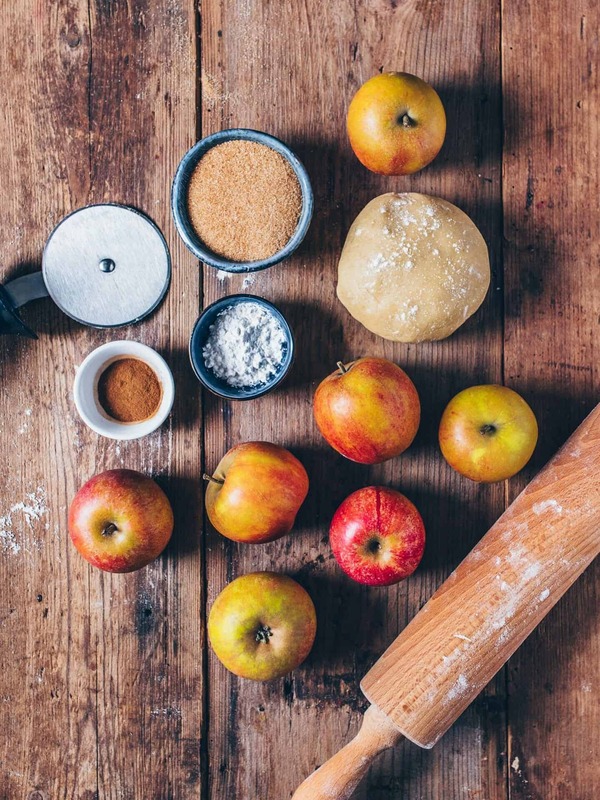 Which type of apples do you recommend using? You can use any apples you like. I usually use sour apples from our garden, but it depends on your taste. 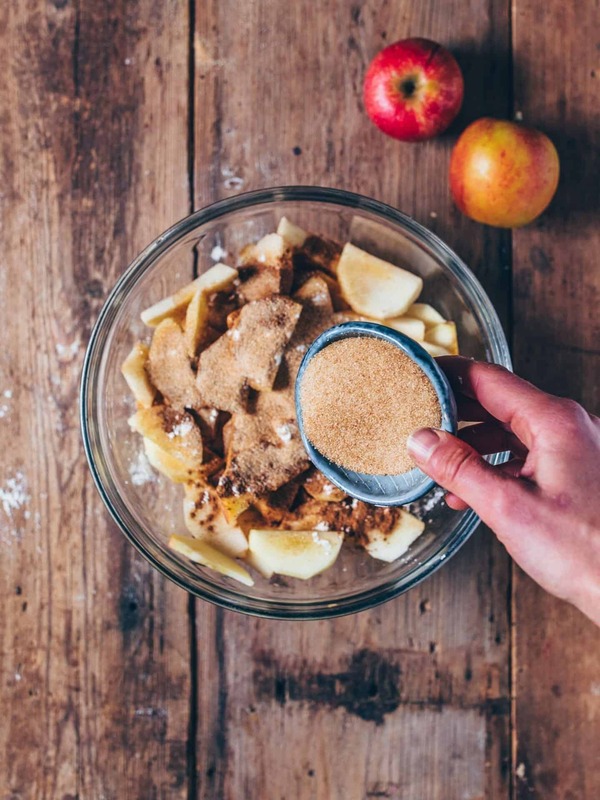 This recipe looked delicious and I had apples so I decided to try it. Indeed, it was worth it to do it 😊 I recommend. I made the apple pie today and it was absolutely delicious. I really loved the pastry it was so crusty.